The ailing electronics group is at once a big debtor, a major employer, and a flag-bearer for cutting-edge Japanese technology. So neither a foreign takeover nor bankruptcy protection would be easy routes to take. A messy state-backed salvage deal remains the likeliest outcome. A man using his mobile phone walks under a logo of Sharp Corp outside an electronics shop in Tokyo, Japan, May 13, 2015. Japan’s Sharp Corp is expected to report a group operating loss of at least 10 billion yen ($84 million) for the nine months ended December 2015 due to the poor performance of its liquid crystal display (LCD) business, the Nikkei business daily reported on Jan. 6. It is uncertain whether the Japanese electronics group can achieve its full-year profit forecast, according to the Nikkei. 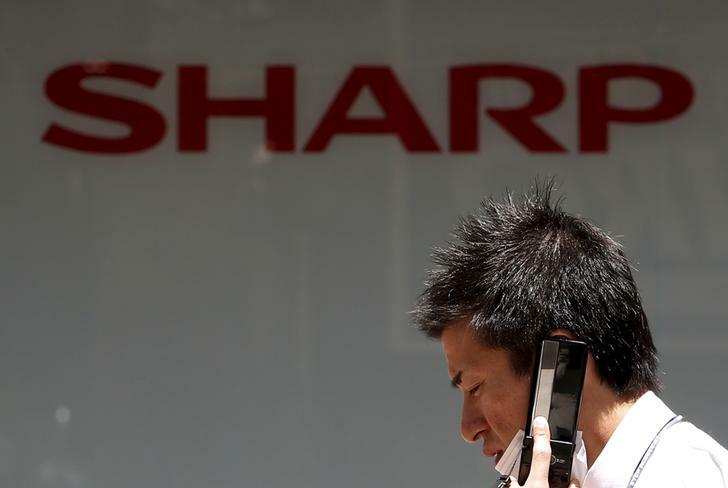 Sharp needs to swing more than 20 billion yen into the black in the January-to-March quarter to achieve its forecast of a 10 billion yen operating profit for the year to March, the newspaper said. Sharp subsequently said it had not changed its full-year financial outlook. It also denied it planned to sell its copiers business. Shares in Sharp stood 2.5 percent lower by noon in Tokyo (0300 GMT) on Jan. 6, at 119 yen per share.